Acquired directly from the artist by John and Ljuba Lefebre, New York. Thence by descent to the present owner. St Gallen, Kunstmuseum, Serge Poliakoff, 1966, no. 106. New York, Lefebre Gallery, Serge Poliakoff, March 1971 (illustrated p. 9). 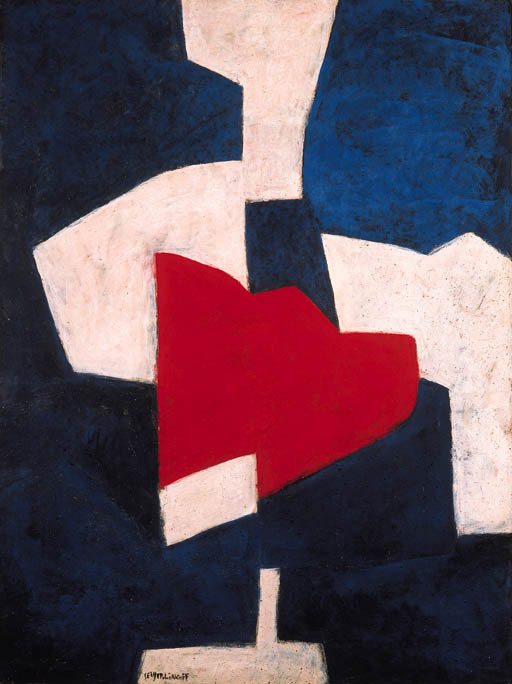 To be included in the forthcoming Serge Poliakoff catalogue raisonné being prepared by Alexis Poliakoff, Paris. Please note that this work is signed again 'Serge Poliakoff' (lower left) and is not dated as stated in the catalogue. The medium is oil and sand on paper laid down on canvas and not as stated in the catalogue.